There is so much good, local food available right now that cooking and eating is just a pure pleasure! We went to the Kits Farmer’s Market this morning and came home with leaf lettuce, 3 kinds of berries (raspberries, blueberries, and blackberries), apricots, cherries, and baby shitake mushrooms. The fish shop has fresh Qualicum Bay scallops, halibut, salmon, and arctic char. So, tonight’s dinner was linguine with scallops in a lemon butter sauce from Donna Hay’s “New Food Fast", and a lettuce and berries salad with a berry balsamic vinaigrette based on a recipe in “Canada Cooks Salads". Dinner on Friday night at Il Terrazzo in Victoria provided a reminder that proseco isn’t just for New Year’s Eve, it’s a wonderful, refreshing summer wine too, so we had a couple of chilled glasses to help with the cooking and eating tonight. 20:03:58 . 2010/07/25	. Doug . 140 words . 2054 views . Food . This recipe is based on one that appeared in the Vancouver Sun Food section just before Christmas. Pre-heat oven to 425°F (220°C). While the oven is pre-heating place a slice of baguette for each oyster in a baking dish, and put them in the oven to crisp up. Turn them once. Slice the leek in quarters, lengthwise, leaving a little at the root end to hold it together while you wash it, then slice the white and pale green part thinly, and discard the rest (or add it to the vegetable stock bin). Chop the garlic finely. Heat the olive oil in a skillet and cook the leek until tender (4 to 5 minutes). Add the garlic and cook 1 minute londer. Pour in the cream and cook until it thickens slightly. Season with salt and pepper and remove from heat. 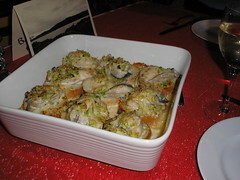 Place an oyster on each baguette slice in the baking dish and spoon the leek and cream mixture over them. Top with Parmesan cheese. Bake 10 minutes, bubbly and starting to turn golden-brown. Serve immediately. 10:57:11 . 2010/01/01	. Doug . 192 words . 2171 views . Food . 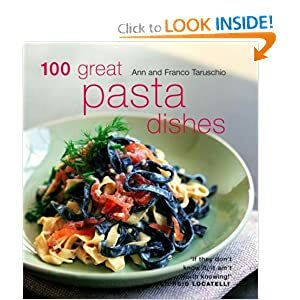 Ours was fabulous, and I’ll bet the Taruschio version is even better! Apart from that we stuck pretty much to the recipe. It is definitely worth the time and effort to julienne the smoked salmon. The sauce fills the kitchen with a fabulous aroma as you reduce the wine, butter, shallots and olive oil mixture. 18:20:51 . 2009/12/29	. Doug . 134 words . 1847 views . Food . with a glass of Rascal of the Vineyard red. Main course was Pasta with Scallops and Lemon Butter from Donna Hay’s New Food Fast cookbook, and a lettuce and bell pepper salad, with Colli Trevigiani Sacchetto Prosecco. This is the first time we’ve had prosecco, and we really enjoyed it. It’s not as dry as the typical champagne, and more flavourful. Excellent value too! Dessert (if we decide we have room later) is a little mincemeat pie from Capers. 20:34:42 . 2009/12/24	. Doug . 107 words . 1592 views . Food . We made pizzas last night. One was a perennial favourite of ours - a Margherita, and the other was inspired by the “French” pizza that one of my co-workers had for lunch last Tuesday at Tomato. Perhaps inspired is too strong a word; I didn’t really pay enough attention to Jon’s lunch other than to hear him call it a French pizza and mention that it had garlic and chèvre on it. The Margherita is the classic Neapolitan pizza. We make ours with a tomato paste based sauce, fresh tomatoes, fresh basil, and freshly grated parmesan cheese. The fresh tomatoes add a special flavour. For the French pizza we started by putting a whole clove of garlic in the oven on low heat to roast. It spent nearly an hour in there while we made the pizza dough, and did other bits and pieces of prep. For the sauce we made a medium thickness béchemal sauce flavoured with some chopped up parmesan rind, black pepper, and a chopped clove of roasted garlic. Topping for the pizza were the rest of the head of garlic, sliced green olives, sliced roasted red pepper, halves of marinated button mushrooms, crumbled chèvre, and chopped fresh tarragon. It feels a little weird to make a pizza without using tomato sauce, but this one worked out well. It seemed to need to cook a little longer than the Margherita to get the crust to the right degrees of crispness. It is certainly a fragrant, flavourful pizza. 14:01:46 . 2009/12/20	. Doug . 253 words . 1641 views . Food .